Transparency Market Research (TMR) has published a new report titled ‘Veterinary Orthopedic Implant Market - Global Industry Analysis, Size, Share, Growth, Trends, and Forecast, 2018–2026.’ According to the report, the global veterinary orthopedic implant market was valued at US$ 86.3 Mn in 2017. It is projected to expand at a CAGR of 7.1% during forecast period from 2018 to 2026. The global market is anticipated to be driven by an increase in companion animal population, rise in pet adoption, and increase in R&D expenditure on animal health. 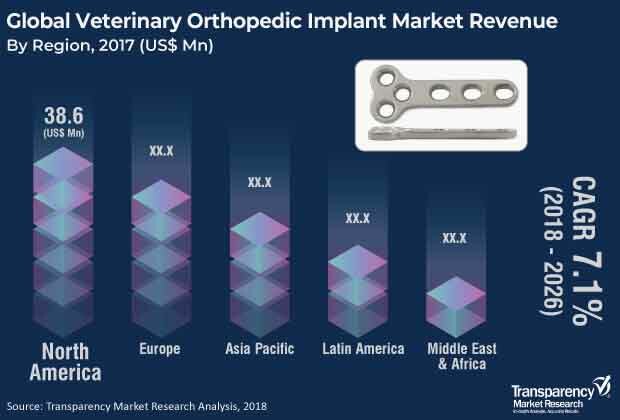 The veterinary orthopedic implant market in North America is expected to expand at a high CAGR of 7.6%, due to an increase in the livestock population and rise in awareness about pet ownership in countries such as the U.S. and Canada. The number of companion animals, including domestic pets, horses, and service animals, is increasing rapidly across the globe. According to the American Pet Products Association (APPA), households in the U.S. owned around 94.2 million cats in 2017 compared to 70 million in 2000. Similarly, the dog population increased by 21.7 million between 2000 and 2017 to reach 89.7 million. Based on the Animal Health Europe Survey (2017), Europe witnessed a 9% increase in pet population between 2012 and 2016. Rise in pet adoption fuels the growth of the veterinary orthopedic implant market. For instance, the pet ownership in the U.S. has displayed an upward trend in the last two decades. Currently, 68% of all households, i.e., 84.6 million homes, in the U.S. own a pet compared to 56% in 1988. Hence, pet ownership has increased by 12% in the U.S. since 1988. Increase in the number of pet owners is expected to drive demand for veterinary care services, which is likely to boost market growth in the next few years. In terms of product type, the global veterinary orthopedic implant market has been classified into veterinary plates & screws, joint replacement implants, and others. Joint replacement implants are further classified into hip replacement implants, knee replacement implants, and others. The veterinary plates & screws segment is projected to account for a leading share of the global market during the forecast period, owing to the wide usage of veterinary plates & screws, especially in sport injuries and accidents. The joint replacement implant segment includes hip & knee replacement implants. The segment is expected to expand at a robust CAGR in the next few years, due to a rise in the prevalence of bone and joint diseases in animals. In terms of end-user, the global veterinary orthopedic implant market has been segmented into veterinary hospitals & clinics and research institutes. The veterinary hospitals & clinics segment held a major share of the global market in 2017. Expansion of the segment can be attributed to the availability of multiple service options and devices and tie-ups with health care companies in order to enhance health care product and service offerings. In terms of region, the global veterinary orthopedic implant market has been segmented into North America, Europe, Asia Pacific, Latin America, and Middle East & Africa. North America is projected to account for a leading share of the global market during the forecast period, owing to high adoption of companion animals, increase in pet expenditure, and presence of a large number of veterinary hospitals & clinics in the region. Europe is anticipated to account for a significant share of the global market between 2018 and 2026. Increase in the number of veterinarians and rise in R&D expenditure on animal health are expected to fuel the growth of the market in the region during the forecast period. The market in Asia Pacific is likely to expand at an average pace in the next few years. This is attributed to an increase in livestock population and rise in the number of companion animals in countries such as Australia and Japan. Australia has 63% pet ownership, which is one of the highest rates in the world. The veterinary orthopedic implant market in Latin America and Middle East & Africa is anticipated to expand at a steady pace from 2018 to 2026. Key players profiled in this report are B. Braun Melsungen AG, Johnson & Johnson, Veterinary Orthopedic Implants, Inc., BioMedtrix, LLC, KYON Veterinary Surgical Products, IMEX Veterinary, Inc., Orthomed (UK) Ltd, and Securos Surgical. Companies operating in the global veterinary orthopedic implant market focus on strategic collaborations, acquisitions, and partnership strategies to expand product offering and strengthen market foothold.